By Stephen Taufen - Kevin Jardell is currently listed in the Alaska Public Offices Commission records as a professional oil and gas lobbyist for ExxonMobil Corp. 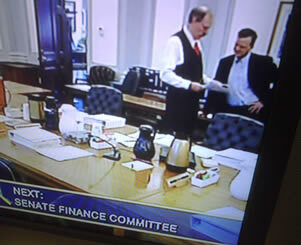 Here's a picture taken from a TV broadcast, via a camera that was on while Finance Co-Chair Senator Bert K. Stedman (R - Southeast Alaska district A) was conferring with Jardell in the Senate Finance Committee room Wednesday morning! It's just days before the end of the governor's 2007 special session to re-write the tainted Petroleum Profits Tax legislation of 2006. Kevin Jardell had a top managerial spot in former governor Frank Murkowski 's Administration, which he represented in legislative hearings on oil and gas during 2006 sessions. Today, one Capitol source saw this tete-a-tete as an impropriety, saying, "The Governor doesn't let [oil] lobbyists in her office ... can you believe that he was allowed into Senate Finance to confer with the Finance Co-Chair?" On February 11, 2003 governor Murkowski appointed Jardell as the assistant commissioner of the Department of Administration, which provides many services to state government, including overseeing the Oil and Gas Conservation Commission. But within one month of leaving the Murkowski Administration behind, Jardell displaced ExxonMobil's former 'head lobbyist' and began the business of preparing for the corporation's biggest challenge yet in Alaska : how to deal with a cowering Legislature, hunkered down after last year's FBI raids on several Legislative offices. Yet before he walked into the Senate Finance room today, Jardell was aware of the six recent convictions (three by plea bargains, three of former legislators found guilty by federal juries of conspiracies, frauds, taking bribes, etc.) involving oil and gas legislation. And he was aware that the Exxon Valdez drunk driving case will be taken up by the Supreme Court, and the state government that he formerly occupied a leading position within would be filing a amicus brief to stand up for Alaska's citizens. Someone has to, and the capable numbers get fewer and fewer as the revolving door keeps on swinging. In Alaska Politics (an Anchorage Daily News story and blog site) on February 9, 2007, reporter Tom Kizzia said, "Last year, Kevin Jardell was a familiar figure in the halls of the state capital, lobbying for a gas pipeline contract as Gov. Frank Murkowski's chief legislative liaison. This year Jardell is once again lobbying the Legislature, but now he's making $10,917 a month working for ExxonMobil, one of the three major oil companies who were negotiating that gas line contract with the state." He added, "The state's executive ethics law is meant to impede the passage through that revolving door. The law doesn't bar officials from going to work for companies they dealt with, but restricts the kind of work they may do for two years. The idea is to avoid conflicts of interest and assure the public that officials act for the good of the state, not potential employers. But the law has wide exceptions." And Jardel said according to Kizzia, "he broke no rules in lining up new lobbying clients." O.K., we get it, the guy's certainly a good hair-splitter and may suffer from 'situational ethics'. In a February 15, 2007 letter to the editor of the Juneau Empire, Gregg Erickson added, "According to the Alaska Public Offices Commission, his lobbying earnings in 2007 will total at least $156,000. Not bad for someone whose track record as a state-paid lobbyist was pretty much a failure." Those who read reporter Sean Cockerham's November 3 article in the Anchorage Daily News will remember that "oil lobbyists have been noticeably absent from the Capitol during this special session." Again, not surprising in the aftermath of the FBI raids and testimonies of Veco's Bill Allen and Rick Smith in this year's federal trials that convicted 3 former Alaskan lawmakers. No word has yet been released about a potential indictment of Frank Murkowski or any of the many oil company executives he regularly met with during 2005-06 when his administration was crafting its own contract proposal for a new gas line and on oil matters. But the one lobbyist who did visit with State House Speaker John Harris this special session was none other than Kevin Jardell. Cockerham's article was distinctly titled, "Scandal brings change to Alaska 's Legislature: Oil industry sends fewer lobbyists to the Capitol" and he wrote of Harris, "He said that lobbyist, Exxon Mobil's Kevin Jardell, didn't even really lobby him." Can we assume in light of how Jardell swiftly secured a top lobbying job for ExxonMobil that fewer lobbyists might mean a better lobbyist? Or one with familiar influence. What is important regarding the power of lobbying is that "keeping 'access' is the ends, and the means for decisions and non-decisions." In "Money Talks" by Dan Clawson and other authors, we are reminded that, "Power is most effective when it shapes the field of action, the behavior of other social actors. It is exercised in many loose and subtle ways. Power may in fact be most effective, and most limiting, when it structures the conditions for action. The mere presence of a powerful social agent alters [that] social space for others and causes them to orient to the powerful agent." Few firms, if any, are a more powerful or influential agent in Alaska than Exxon, in terms of the minds of the people and impacts on the State government. But that power can be weakened - if others let it be - when the legitimacy of such a corporation falters. And Exxon Mobil is also in the rare class of those whose integrity and honesty of its agents are, or should be, totally in doubt. Both Jardell and Stedman know this, but there is a key difference. It is the former's job to weasel his corporation back into the fold in a case like this. And he knows that altering a legislator's memory, to ensure ownership of most recent thoughts, to have the most current influence, is his job. But, at this sensitive time - the final days of a special session on oil taxes - the expectation on the latter is to not be so cozy. Appearances will rule over substance, First Amendment or not. After all, Exxon Mobil had no trouble getting its testimony time in during the House business the last two weeks, so it ought to just sit in the Senate Finance back row and wait like a common 'legal person' for its turn. That is, Stedman could have waved him off. So, we hope that there was a legitimate and imperative PUBLIC need for the two to be talking at that moment; because maybe this isn't all that far off from Bill Allen's leaning over the rail at the Senate. Did Jardell use his "special in"? On Frank Murkowski's behalf, Jardell's answers were appropriately political in their clarity, such as "The governor intends to hold the public comment period for as long as the process takes to gather thorough input from the public." So much for 60 or 90 days and assuredness to the public that sufficient time would have been allowed. We don't want to so restrict the input of large corporations that legitimate information and wise rationales are not heard. Governments partner with businesses to accomplish infrastructure building projects and build schools. But extractive resources - especially the determination of their value to a government of people - is a special arena. An arena of billions lost or billions gained. And this year's special session in the Legislature, post-FBI raids, has added a copious amount of 'gingerly' to the political soup to make it more palatable to the masses, rather than serve non-Alaskan tastebuds. Stedman should help keep the soup edible. A public watchdog and advocate for fishermen and their coastal communities. Taufen is an "insider" who blew the whistle on the international profit laundering between global affiliates of North Pacific seafood companies, who use illicit accounting to deny the USA the proper taxes on seafood trade. The same practices are used to lower ex-vessel prices to the fleets, and to bleed monies from our regional economy.